The deportation state that Obama and Trump radically expanded is no longer content to just go after the undocumented. Its targets increasingly include citizens and political dissenters of all kinds. 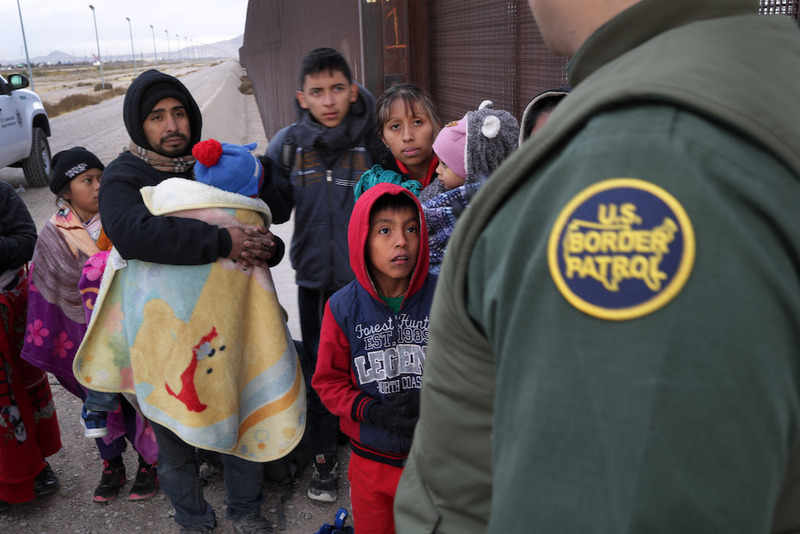 A US Border Patrol agent and Central American migrants at the US-Mexico border in February. John Moore / Getty Images. The creation of a class of “others” can be a useful thing for a young, blooming authoritarian regime. First you decide some group or another deserves special scorn and vilification; next you create a special government apparatus to treat this group as chattel with little rights or human dignity; finally, you let the edges of this apparatus slowly blur into other parts of society, until the overstep is grudgingly accepted by the public and its remit is further expanded. That appears to be what’s happening in Trump’s America right now. Trump’s immigration policies should be opposed, first, because he, like Obama, is uprooting and expelling breathtakingly large numbers of immigrant populations who have resided, set up lives, and even made families in the country, sometimes for as long as decades. But even if you’re not undocumented — even if you actually approve of all this — there’s another reason to be worried. Just as marginalized groups have historically been used as the canary in the coalmine for justifying greater and greater encroachments on civil liberties (the way George W. Bush pointed to Muslim terrorists while he built up the post-September 11 surveillance state), so the activities of the increasingly extreme deportation machine are bleeding ever more extensively into the rest of American life. Last month, the NBC 7 television station in San Diego revealed that immigration agents with Immigration Customs Enforcement (ICE), Customs and Border Protection (CPB), Border Patrol, Homeland Security, and the FBI had built up and were using a database of journalists, activists, and an immigration attorneys, all of whom were to be flagged for extra screening at the border. The lawyer and seven of the journalists are US citizens, and a number of them had reported getting extra scrutiny from border officials prior to the revelation of its existence. Earlier this year, the ACLU raised the alarm over what appears to be a trend of ICE targeting immigration activists for arrest around the country due to their political work, a fact that, as the organization points out, has grave implications for free speech. Many of the activists didn’t even have criminal records. Perhaps more ominously, in January the Department of Homeland Security released a slickly produced video that looked like it could’ve been directed by Christopher Nolan, showing CPB carrying out a “large scale civil unrest readiness exercise,” with officers clad in military gear putting on gas masks and marching in formation to an orchestral score. A week before its release, it had carried out a similar drill at the border crossing in San Diego, marching to the border, letting off smoke and flash bang grenades, and temporarily halting traffic. It was probably just a coincidence this all took place in the midst of the longest and most acrimonious government shutdown yet. Then there’s the way the government’s deportation activities have increasingly seeped into, and swept up, segments of American society they were never originally meant for. ICE has begun carrying out military-style raids on businesses in which officers indiscriminately arrest and detain dozens of people, including minors, legal immigrants, and even US citizens. They’ve started doing raids in courthouses, ignoring the objections of judges who fear it could undermine the legal system, and Trump’s administration has hacked away at due process and the independence of immigration courts. ICE now regularly uses excessive force, tricks arrestees, enters homes without warrants, and makes use of mass surveillance, as if to make the links between the deportation machine and a burgeoning police state explicit. At one point, ICE’s then-acting director urged prison time for politicians who resisted their efforts. There has been instance after instance of US citizens being swept up in this deportation campaign, sometimes upending their lives in the process. A PTSD-stricken Marine veteran handed over to ICE after his arrest; two Montana women detained and questioned for speaking Spanish; a San Bernardino woman detained by ICE after a night in jail for a decade-old legal snafu; and the list goes on, numbering nearly 1,500 over the past seven years. One citizen was held for three and a half years, initially due to an administrative error, only to be suddenly dumped in the middle of nowhere with nothing but his prison clothes; just recently, CBP detained a nine-year-old US citizen for more than thirty hours, accused her fourteen-year-old brother, also a citizen, of human trafficking, and even got him to sign a document saying she wasn’t his sister but his cousin. All of these individuals were people of color. One final reason for concern: this segment of the national security state is explicitly aligned with Trump and the far right. The Border Patrol union, which gave its endorsement to Trump in 2016, has become one of the president’s most steadfast allies. The union’s official podcast is recorded and edited in a Breitbart studio. Just last month, the Nation reported that ICE has been keeping tabs on “anti-Trump” protests in New York, including an anti-fascist rally organized by an elected local Democrat. It’s no wonder even the Washington Post likens ICE to a kind of Praetorian Guard for Trump. Slowly, the sweeping deportation apparatus escalated by Obama and Trump has begun to make nationally manifest the fears first triggered by Arizona’s infamous “show me your papers” law in 2010, which gave the state’s law enforcement legal leeway to racially profile and harass Hispanic communities. This shouldn’t surprise us. After all, ICE itself was a child of the “war on terror,” created to hunt down and remove supposed foreign terrorist threats before morphing into the primary instrument of legally sanctioned ethnic cleansing, a neat symbol of the passing of the torch from terrorists to immigrants as the primary boogeyman used to expand the authoritarian state. “Mission creep” is usually only brought up when it comes to foreign intervention, but it applies just as much to the domestic sphere. Just as the “war on terror” did for more than a decade, we’re now seeing the deportation state in real time gradually elbow its way beyond its initial purpose, targeting citizens, legal immigrants, and political dissidents. John Barron is a pseudonym.